This fall, Coronado High School (CHS) will further broaden the options offered to students for online learning. In a recent proposal he submitted to the Coronado Unified School District (CUSD) school board, Super-intendent Dr. Jeff Felix cited a 2014 State of the K-12 Market report that focused on a rise of flipped and blended online instructional models and the proliferation of online learning. “This research reminds us that…online learning is an extremely valuable asset to pursue,” Felix said. Felix explained that these “flipped and blended online instructional models” have students watch initial lessons online, prior to attending class. Then, during class hours that follow, teachers use the class time to help students practice what they learned from the online lesson. (This model “flips” the traditional model, wherein teachers provide the initial lesson during class time, then students are assigned practice work to complete on their own time at home.) “Flip learning is an exciting advent,” Felix said. “Not only does it give a child the opportunity to learn at their own pace in the comfort of home, it ensures they’re not practicing the skills incorrectly outside of the classroom.” Furthermore, he explained, this model allows students to watch lessons as many times as they need to grasp concepts. CHS Principal Jenny Moore explained that math teacher Katie Leverich has also implemented her own version of flipped online instruction. Leverich video-records herself giving math lessons and posts them online. Students are asked to watch the lessons at home, then class time is dedicated to focused practice while Leverich circulates throughout the classroom providing one-on-one guidance. Another online learning component at CHS is that students needing some remediation are able to make up course credits through an online software program called Edgenuity, which is facilitated by a CHS teacher. This program is not a flipped or blended model; rather more of an independent, online course model, where the student studies and partakes in course material on their own and his or her progress is monitored and guided by an instructor who is not involved in actual lesson planning for the particular course. More independent online learning models (through the Edgenuity software and others no longer used) have been executed with success at both Palm Academy and Coronado Pathways Charter School for students needing to remediate course credits in an alternative setting, and CHS is now looking to those schools to enhance its more independent online offerings to students. 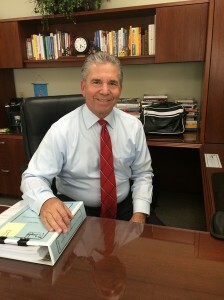 In fact, Moore, Felix, and Palm Academy and Coronado Pathways Charter School Principal Kevin Nicolls have proposed to the school board that, beginning this fall, the online class structure offered at Palm Academy become available to students at CHS, making Palm Academy more of an integrated division of CHS. (The plan also calls for allowing Palm students to become involved in CHS extracurricular activities such as athletics.) “We have a goal of offering the learning options afforded by Palm Academy and Coronado Pathways Charter School to all students at CHS as well as offering the social options at CHS to the students at Palm Academy,” Felix explained. “We’d like to take the personalized online learning services at Palm and provide the same type of individualized opportunities for all CHS students. Coronado Unified School District Superintendent Dr. Jeff Felix has envisioned the integration of Palm Academy and Coronado High School services for the past five years.